Ryan Fonte, young tennis player. Guess we’ll never see how he looks li- here you go. Another athlete, but well, he’ll never appear in the comic… right? VERY IMPORTANT ANNOUNCEMENT: The nominations for the 2018 *Ursa Major Awards are open! 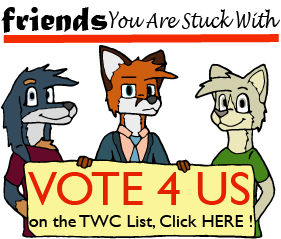 If you believe Friends You Are Stuck With deserves to be considered, please go to this site, follow the instructions and nominate us for Best Anthropomorphic Comic Strip! Season 2 was our best one yet and it deserves to be nominated 😀 Landing this nomination would be huge for the comic. Thanks. *The UMA are celebrates annually the excellence of the Anthropomorphic Arts.